Are you in the market for a new pillow, but just can’t decide which style is best for you? Say no more. The ComfySleep Buckwheat pillow is here and hopes to open your eyes to a whole new pillow type. Does Buckwheat have what it takes to catch your eye? Continue reading below to find out! Short on time? Click here to skip on down to the review summary. The ComfySleep Buckwheat pillow is constructed from 100% USA-grown buckwheat and an organic cotton cover. The buckwheat does not contain any chemicals or fumigants. The ComfySleep Buckwheat pillow is constructed from 100% USA-grown buckwheat and an organic cotton cover. The buckwheat does not contain any chemicals or fumigants. This pillow can most certainly be considered a healthy alternative to most pillows available today. The Buckwheat is designed to provide a firm, moldable feel, but is not responsive. Buckwheat does not respond to pressure. Instead, the buckwheat shuffles around inside the pillow to allow the sleeper to shape the pillow how they’d like. Additionally, the pillow contains a zipper at one end of the cover. The zipper was implemented into the cover in order to give the sleeper the ability to customize their pillow. 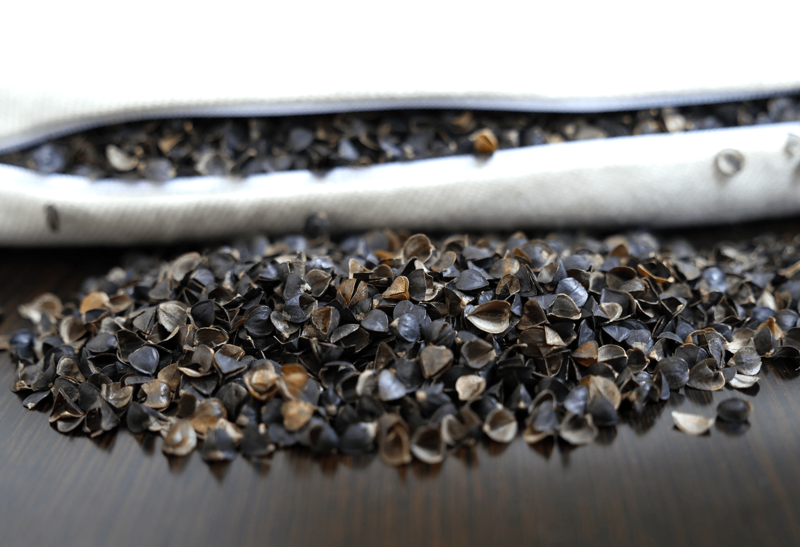 Buckwheat can be removed from the pillow to flatten it out to the sleepers desired level. Looking for the right brand? Check out my favorite buckwheat pillows page! The cover of the Buckwheat pillow is crafted with an organic cotton cover and invisible zipper. The organic cotton provides a breathable surface as well as a somewhat softer feel on top of the buckwheat fill. The lining of the zipper cannot be seen unless you unzip the pillow to remove / add some of the fill. This makes for a much cleaner look all around. Aesthetically speaking, the cover is fairly basic. There is no pattern woven into the cover and the color scheme, off-white, is the same all the way around. As a fully adjustable pillow, the ComfySleep Buckwheat pillow falls into somewhat of a unique space. While I have tested other adjustable pillows, none of them have been quite like the Buckwheat. Typically, adjustable pillows contain latex or memory foam components, but that is obviously not the case here. Buckwheat offers a much different feel than any other material I have tested thus far. For starters, a buckwheat fill makes for a very firm pillow. 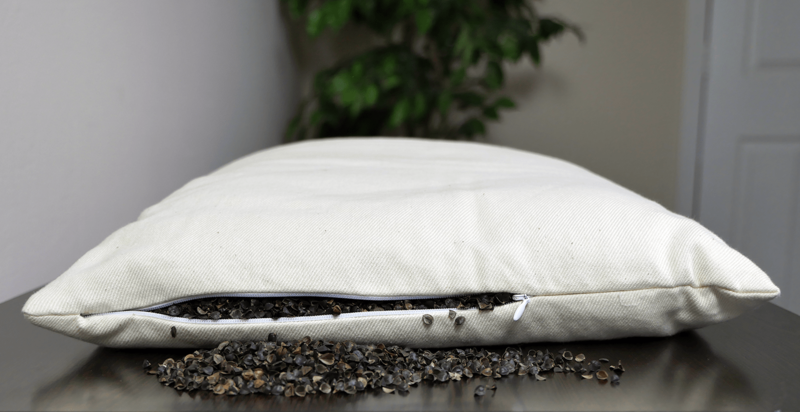 Although buckwheat is not a hard material, thousands of them stuffed into a pillow definitely makes for a firmer feel than most other materials. Even after removing some of the interior, I still felt as if the pillow was just too firm for my liking. That said, the pillow does adjust to the area around your head and neck nicely. Since buckwheat does not have the ability to respond when pressure is applied, the pressure tends to separate the fill, creating thicker ends of the pillow. Although this is not the case if you mold the pillow prior to lying on it. For example, you could ball up / fold the pillow and the buckwheat will remain stagnant, for the most part. With the fully adjustable option, I expected this pillow to sleep comfortably in virtually every position. This was not necessarily the case. As a stomach sleeper, the pillow did not really meet my needs. It was too firm. I was not able to sink into the pillow which created an uncomfortable angle along my spine. On the other hand my cousin and wife found the pillow to be slightly more comforting. My wife is primarily a back sleeper and found that the pillow cradled her head / neck nicely, allowing for consistent spinal alignment during her sleep. My cousin a side sleeper, had virtually the same results. Although, he did have to remove more of the buckwheat fill in order to receive the proper level of support. All in all, this pillow is definitely suited for back sleepers and could work for some side sleepers as well. Cooling was one of the better qualities associated with the Buckwheat pillow. The buckwheat fill and organic cotton cover combine for a high level of airflow in and out of the pillow. During the sleep tests the buckwheat pillow remained cool and the material does not retain heat. Finally, the main issue I found with this pillow was the noise. Any movement of the pillow and the buckwheat fill creates an extremely noticeable level of noise. For those lighter sleepers, this can become somewhat of an annoyance very quickly. While my wife slept on this pillow, I was able to hear any movement she made on this pillow. Unfortunately, this created a less peaceful sleeping environment for the both of us. If you’re a heavier sleeper and / or you sleep alone the noise may not be a factor. Weight – ranges from 4-8 pounds depending on the size. An additional small bag of buckwheat comes separately with the pillow as well. 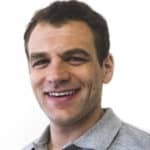 Who should buy the ComfySleep Buckwheat pillow? Want a 100% buckwheat pillow – constructed with a 100% buckwheat fill, this pillow is very firm. Additionally, the pillow does tend to create a notable amount of noise due to the buckwheat fill. Want a healthy pillow – handmade, organic cotton grown / woven in the USA, buckwheat hulls clean without chemicals or fumigants. Sleep on your back – as a firmer pillow, back sleepers will find the Buckwheat much more enjoyable than side / stomach sleepers. The buckwheat prevents you from sinking deeply into the pillow, therefore creating an appropriate alignment of the spine. Some side sleepers may find this pillow enjoyable as well. Want an adjustable pillow – this pillow has a zipper on one end of the cover and opens up to allow for removal of the interior fill. This gives sleepers the option of pulling out some of the buckwheat and adjusting it to their preferred loft. This can be beneficial for the sleeper who struggle to find the proper amount of loft in a pillow. For more on this pillow visit ComfySleep on Amazon.com. The ComfySleep buckwheat pillow is a natural, organic alternative to firm and supportive pillows. With a 100% buckwheat fill and organic cotton cover, this pillow offers a vastly different feel than most traditional latex / memory foam pillows. Additionally, this pillow is fully adjustable, giving the sleeper the opportunity to remove some (if any) of the fill to bring it down to their desired loft. Back sleepers, as well as some side sleepers will find this pillow most enjoyable.